A triangle has three internal angles of 75, 60, and x. What is x? The internal angles of a triangle must add up to 180. 180 - 75 -60= 45. To find the perimeter, add up the sides, here 5 + 12 + 13 = 30. To find the area, multiply the two legs together and divide by 2, here (5 * 12)/2 = 30. 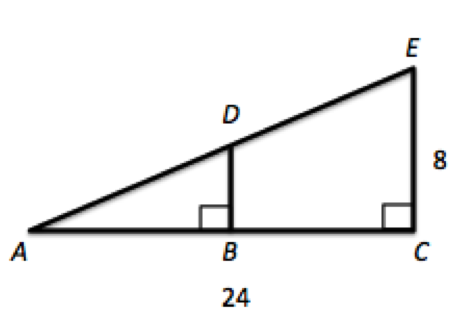 Given triangle ACE where B is the midpoint of AC, what is the area of triangle ABD? If B is a midpoint of AC, then we know AB is 12. Moreover, triangles ACE and ABD share angle DAB and have right angles which makes them similar triangles. Thus, their sides will all be proportional, and BD is 4. 1/2bh gives us 1/2 * 12 * 4, or 24. What is the area of a right triangle with hypotenuse of 13 and base of 12? Area = 1/2(base)(height). You could use Pythagorean theorem to find the height or, if you know the special right triangles, recognize the 5-12-13. The area = 1/2(12)(5) = 30. Therefore Quantity A is greater. The radius of the circle is 2. What is the area of the shaded equilateral triangle? This is easier to see when the triangle is divided into six parts (blue). Each one contains an angle which is half of 120 degrees and contains a 90 degree angle. This means each triangle is a 30/60/90 triangle with its long side equal to the radius of the circle. Knowing that means that the height of each triangle is and the base is . Applying and multiplying by 6 gives ). A triangle with a fixed perimeter does not have to have a fixed area. 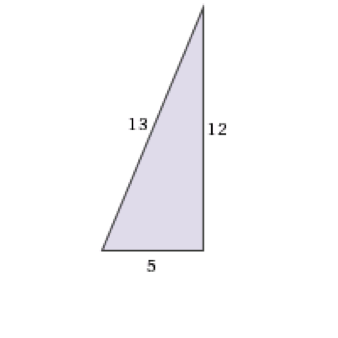 For example, a triangle with sides 3, 4, and 5 has a perimeter of 12 and an area of 6. A triangle with sides 4, 4, and 4 also has a perimeter of 12 but not an area of 6. Thus the answer cannot be determined. Given the diagram, indicate if Quantity A is larger, Quantity B is larger, if they are equal, or if there is not enough information given to determine the relationship. The relaionship cannot be determined from the information given. 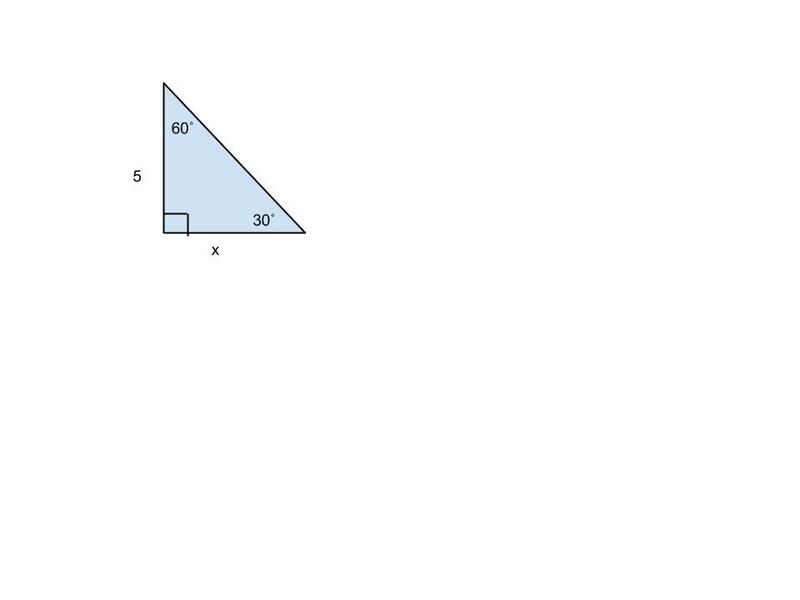 Since this is a 30-60-90 triangle, we know that the length of the side opposite the 60 degree angle is times the side opposite the 30 degree angle. Thus, , which is about 8.66. This is larger than 7.5.